Your ScienceSource.ca access can be upgraded by obtaining access codes for special features. Access codes can easily by applied to your ScienceSource.ca account via the code entry box below if you are logged in as a teacher. Below is a list of features and access options currently available or coming soon to ScienceSource.ca. Clicking "Purchase Now" will lead you to the Pearson Online Catalog where you can obtain Access Codes. Or phone the Pearson Ordering Department direct and toll-free at 1-800-361-6128. It is not necessary to have a ScienceSource.ca account to explore all of the available resources. ScienceSource PREVIEW allows all users to see all resources for the first chapter of each book. In order to view resources for other chapters, you will need to purchase ScienceSource BASIC access. 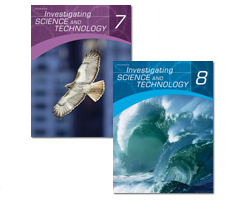 ScienceSource BASIC for IS&T 7/8 is included with the purchase of a Teacher Resource Manual (TRM). When you purchase a TRM, you will receive an Access Code that will allow you to register for ScienceSource BASIC. ScienceSource BASIC includes access for all the teachers and students in your school. Web links - carefully chosen and screened for appropriateness, these links support research features in the Investigating Science And Technology 7 and 8 textbooks. End-of-Section Interactive Quizzes - these online mulitple choice questions provide instant feedback and marking. Activities - interactive Internet activities plus extra teaching ideas. Puzzles - interactive puzzles that can be done online, also downloadable in form suitable for photocopying. Podcasts - links to excellent Internet audio programs that supplement textbook content. Special Internet Multimedia Resources - links to fascinating images and video files. Teacher Corner - the Teacher Corner, which contains professional development materials made specifically for Ontario teachers, electronic versions of Teacher Resource Manual materials, and many other resources helpful for instruction. Teacher Electronic Student Book Files - the Teacher Corner also contains conveniently downloadable Adobe Acrobat Electronic Student Book Files for teacher use. My ScienceSource - the My ScienceSource page allows you to define your user passwords and customize the ScienceSource.ca experience for you and your students. ScienceSource 7 PLUS includes access for all the teachers and students in your school. In order to purchase ScienceSource 7 PLUS, you must first have ScienceSource BASIC access. Includes eBook Access! With ScienceSource PLUS, there is no need to purchase eBook Acccess separately. Chapter and Unit Review Interactive Quizzes - multi-format questions provide instant feedback and marking. Supplementary Labs - many extra challenging lab activities that supplement textbook content. Key Lab Videos - these videos demonstrate one key lab activity per textbook chapter. Simulations - unique interactive simulations that allow students to experiment online. Animations - special animations that help reinforce key concepts. Student Use Electronic Student Book Files - Never again worry about forgetting your textbook at school! ScienceSource PLUS provides convenient online access to Investigating Science and Technology. The Electronic Student Book files for student use are provided in conveniently downloadable Adobe Acrobat format. ScienceSource 8 PLUS includes access for all the teachers and students in your school. In order to purchase ScienceSource 8 PLUS, you must first have ScienceSource BASIC access. In order to purchase eBook Access, you must first have ScienceSource BASIC access. NOTE: PURCHASING EBOOK ACCESS SEPARATELY IS NOT REQUIRED IF YOU HAVE UPGRADED TO SCIENCESOURCE PLUS. eBook Access is provided as a separate upgrade for schools that do not wish to purchase ScienceSource PLUS, or wish to obtain a copy of the Electronic Student Book Files on CD. Never again worry about forgetting your textbook at school! 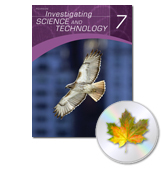 eBook Access provides convenient online access to the Investigating Science and Technology 7 textbook. Teachers and students will be able to access and conveniently download all eBook files. All eBook files are provided in Adobe Acrobat (pdf) format for easy loading and maximum compatibility. When you purchase the eBook, you will receive the files on CD for offline use, as well as an access code for online eBook Access. 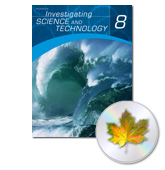 eBook Access provides convenient online access to the Investigating Science and Technology 8 textbook. Teachers and students will be able to access and conveniently download all eBook files. All eBook files are provided in Adobe Acrobat (pdf) format for easy loading and maximum compatibility. In order to purchase Image Bank Access, you must first have ScienceSource BASIC access. Image Bank Access provides convenient online access to selected images from the Investigating Science and Technology 7 textbook. A special section of ScienceSource.ca will provide easy access to images. These images are especially convenient for including in notes, projects, presentations or class notes. When you purchase the Image Bank, you will receive the image files on CD, hard-copy transparancies, as well as an access code for access to the images at ScienceSource.ca. Image Bank Access provides convenient online access to selected images from the Investigating Science and Technology 8 textbook. A special section of ScienceSource.ca will provide easy access to images. These images are especially convenient for including in notes, projects, presentations or class notes. In order to purchase Student Success Companion Access, you must first have ScienceSource BASIC access. The Student Success Companion is designed to provide extra student support and scaffolding for all lessons, chapters, units and key activities in Investigating Science and Technology 7. It is designed to be used in conjunction with the textbook and is available in copyable Line Master and consumable workbook formats. The Answer Key for teachers provides correct answers for selected response questions, suggestions for answers to open-ended questions, and teaching notes at key points in the teaching sequence. The stand-alone Answer Key in Adobe pdf format is made available for teachers using the Student Success Companion in the consumable workbook format. The digital files for the Answer key are provided on CD and include access to the same files here at ScienceSource.ca. The Student Success Companion is designed to provide extra student support and scaffolding for all lessons, chapters, units and key activities in Investigating Science and Technology 8. It is designed to be used in conjunction with the textbook and is available in copyable Line Master and consumable workbook formats. The copyable Line Master version of the Student Success Companion is available as a single package with hard-copy, Adobe pdf and Microsoft Word™ formats. The Word version allows teachers to modify the pages of the Student Success Companion to suit the needs of their particular students. The Answer Key for teachers provides correct answers for selected response questions, suggestions for answers to open-ended questions, and teaching notes at key points in the teaching sequence. It is available in Word and Adobe pdf formats. The Word version allows teachers to modify the Answer Key to reflect any changes made in the Word version of the Line Masters. The digital files for the Line Masters and Answer key are provided on CD and include access to the same files here at ScienceSource.ca.